I purchased a 20KG Digital Servo, DS3218MG with a Control Angle of 270° . using a 470uF capacitor and then tried a 680uF capacitor. What am I doing wrong? Is there something else I could look at? The power cord I'm using to connect the arduino is 12V DC 1A. Orange wire goes to GND on arduino, the long green goes to ~9, yellow goes to VCC on battery pack. The DS3218MG servo motor is a strong servo motor and it requires more current than normal servo motors. With a normal servo motor the peak current can be 500 mA or even 1 A. This DS3218MG is specified somewhere at 1.8 A stall current (only 80 to 100 mA during normal operation). However this YouTube video measures a stall current of 2.3 A. During normal operation, the average current will not even be near the stall current. The peak current on the other hand can be close to the stall current. The peak current occurs at the moment that the servo motors starts to move. You need a 5 V 2.5 A power supply for that servo motor, together with wires and connectors that are suitable for that current. You could cheat a little by adding a capacitor. I suggest 2200 µF or 4700 µF. It is a common mistake to underestimate the current of a servo motor. A power supply is often more expensive than the servo motor. If a lot of torque is required, perhaps a geared motor is easier to use. 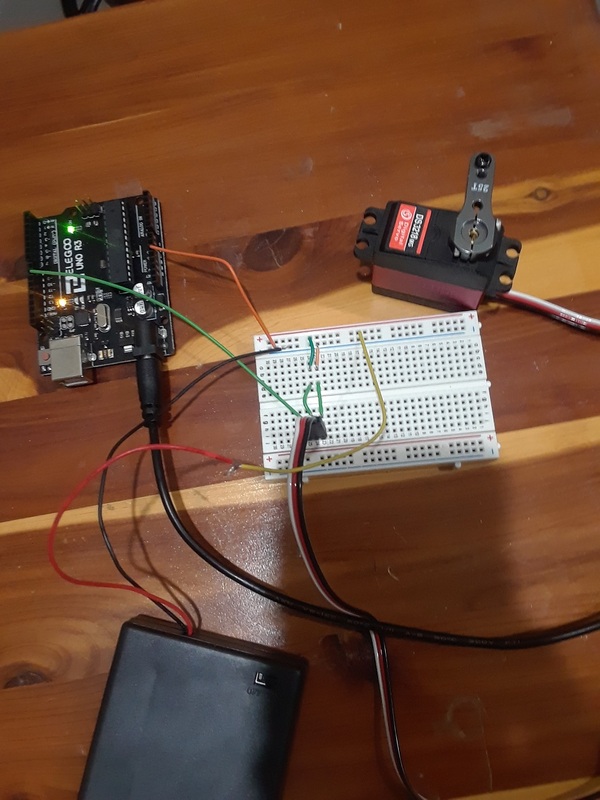 My guess is that the servo is drawing too much current from the Arduino 5v pin which can provide up to ~450mA when powered from USB and ~650mA from power jack. Try providing 5v from an other source to the servo while keeping the GND of that power source and the Arduino common.